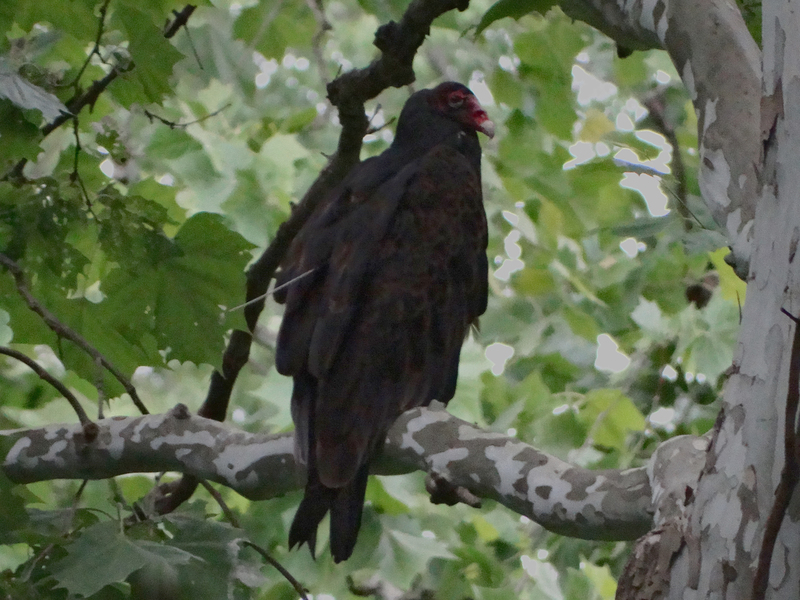 Yesterday, Hawk Mountain Sanctuary Summer Field Experience Interns Kaitlin Schafer and Emile Luttman, and I drove more than an hour through pouring rain to try to find a special Turkey Vulture. 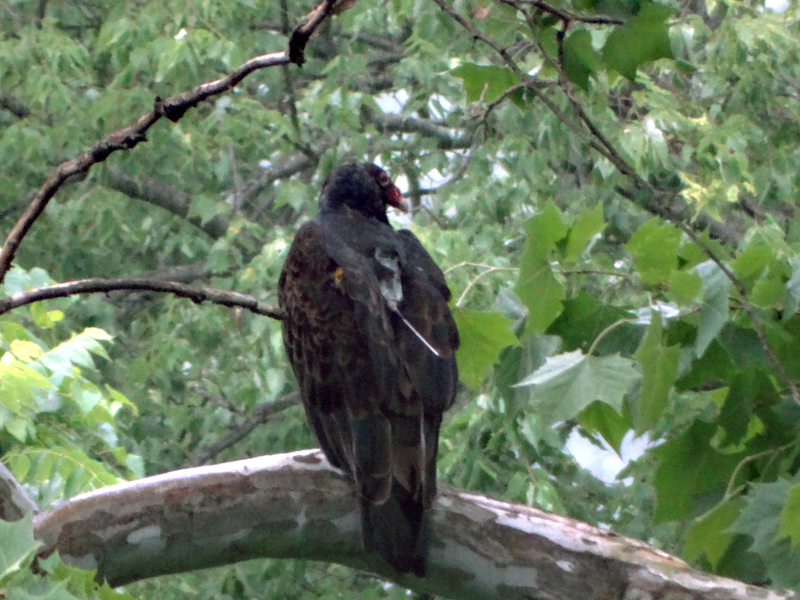 Named in honor of Irma Broun, the wife of the Sanctuary’s first ornithologist Maurice Broun, Irma the Turkey Vulture had been caught by then Hawk Mountain Graduate Student Jamie Mandel at a garbage dump in Penn Argyl, Pennsylvania, in August 2004. Shortly thereafter she was tagged with a solar-powered satellite tracking device. We also placed a data logger in her body cavity to record her core body temperate and heart rate. Placing the latter in Irma meant that we would need to recapture her the following year to extract the logger and download the data. Former Hawk Mountain Graduate Student Jamie Mandel at work in the field. The bad news is we were never able to re-catch Irma in 2005 despite numerous attempts to do so. The good news is that both she and her tracking device are both still ticking more than a decade later. The tracking devices have a life expediency of three to five years, so Irma’s unit by far is our best overachiever. This summer Kaitlin and Emilie have been spending time mapping Irma’s movements. Although she migrated to South Jersey during the winters of 2004-2005 and 2005-2006, since then she has been a year-round resident of an area near Easton, Pennsylvania, and Phillipsburg, New Jersey, shuttling between feeding and roosting sites on both sides of the Delaware River. Last week we decided to try and reconnect with her. Using the movebank.org website that we use to store our tracking data, we located Irma’s roost site on the evening of Friday 19 June. She appeared to be resting for the night in the middle of a hilly old-growth forest outside of Riegelsville, New Jersey. Our plan, outrageous as it seemed, was to go to the forest, spot Irma, and photograph her. We arrived at the forest a little after 8 a.m. on June 20. The rain had kept the vultures in their roosts later than normal so we thought that we might get lucky. As we approached Irma’s last location GPS location, we slowed the car to a crawl and began to search for basketball-sized black objects perched in trees. Almost immediately Emile screamed from the back of our Subaru Forester, “Stop, stop!! Backup … I saw her.” Backup we did, and there she was, soaking wet, 30 feet up in a large sycamore, 30 yards from the side of the road. As soon as we put binoculars on her we could see the antenna of the tracking device. 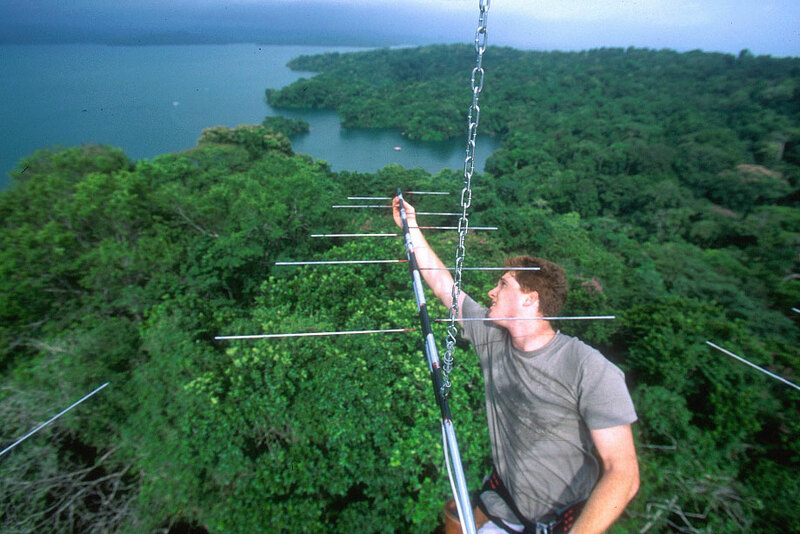 Irma then accommodated us by turning completely around to show us both the antenna and the device. Although feathers normally cover the device on perched birds, the rain had soaked her feathers permitting us to see the unit itself. After 15 minutes of snapping photos (and yes, we took dozens) and looking for other vultures in the forest (we saw none), we got back in the car just as the rain picked up and drove off… all three of our heads spinning. Fifteen minutes later we were having a hot breakfast in Riegelsville. Irma and her tracking device, spotted more than a decade after this vulture was first tracked and tagged. To successfully catch and satellite tag a wild bird is one thing. I still get chills when I do so. But to be able to track a wild bird and its movements for more than a decade is something else again.To be able to spot the same bird perched in a thick forest on a rainy morning more than 10 years after first releasing it is truly is an ornithological epiphany. Emilie, Kaitlin, and I plan to finish our analysis of Irma’s movements this summer, and I plan to spend September writing up the results. All of the publications I have been involved with over the years have been unique, but this one not only will be unique, but remarkably unexpected as well. And yes, pending funding, I plan to mount an effort to re-catch Irma later this summer, so that we can replace her current tracking device with a new one and keep the information rolling in. Another view of Irma on the morning of June 20 in a wet forest outside Riegelsville, New Jersey.